In Livingston County, this survey followed portions of the Hannibal-to-St. Joseph wagon road first surveyed in 1820. The 1843 survey started at the southwest corner of the public square in Chillicothe and ran generally southwest to Utica. From Utica it ran generally west to the Caldwell County line then southwest through Kingston to Transue's Mill near Plattsburg in Clinton County. 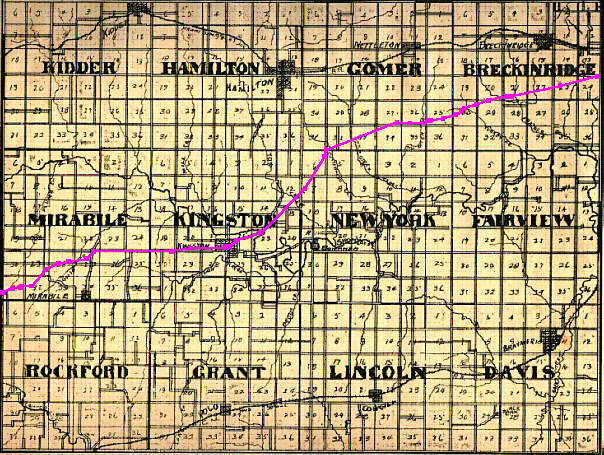 The certified route description was signed in June, 1843 by John S. Harper, Surveyor. The road entered town from the northeast, intersecting Main Street, then west on Main Street, south on Catherine Street, west on Matson Street, south on Throop Street, west on Vanzandt Street, south on Fellow Street to the south line of the town of Utica. 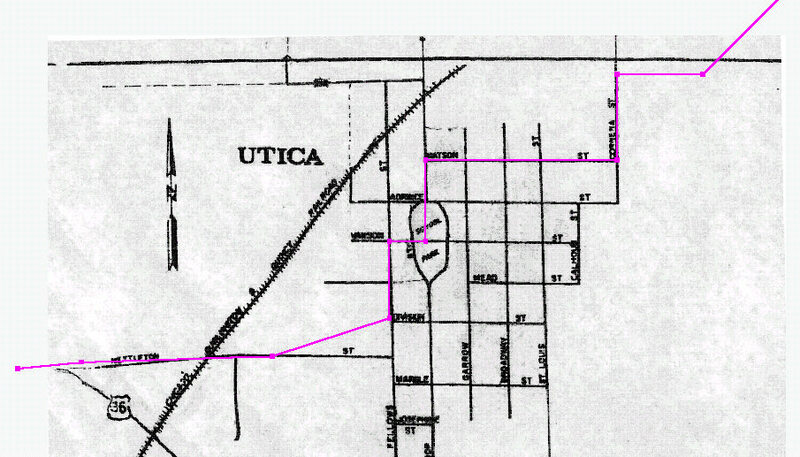 This view shows the 1843 survey superimposed on an early twentieth century map of Utica. Only those affected landowners in western Livingston County were identified. The state hired overseers to supervise the maintenance of the road. In 1849, part of this road in western Livingston Co. was managed by John Stuckey (1810-1890). His contract required that the road be "causewayed and dug, the ravines therein filled up, and the small watercourses therein bridged, the roadway cut out and maintained thirty feet wide and cleared of trees and limbs which might incommode horsemen and carriages, and cleared of stumps exceeding eight inches in height." This background map of Mooresville Township was published in 1878. The 1843 survey is superimposed in color. In the early part of the twentieth century, before U. S. Highway 36 was paved, signs posted on this road between Chillicothe and Mooresville identified it as the "Pikes Peak Ocean-to-Ocean" road. 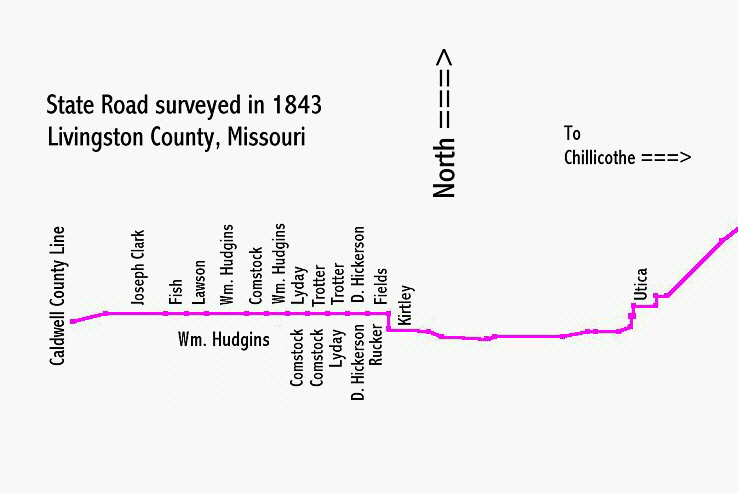 The 1843 survey through Caldwell County is shown below. 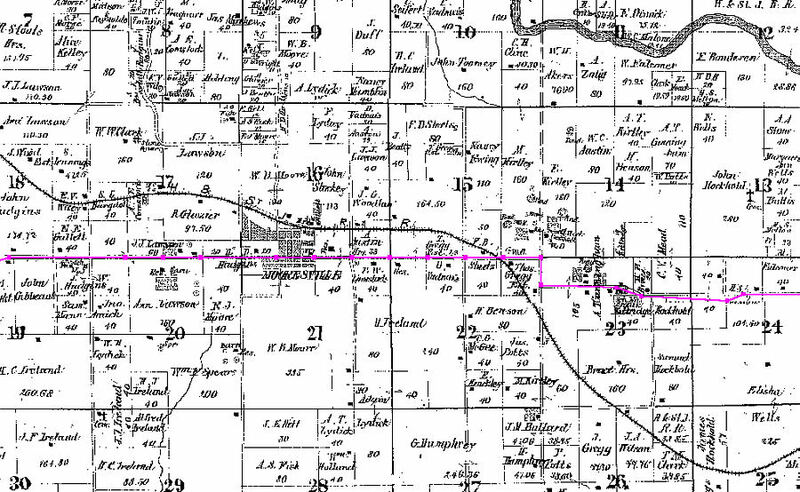 If this portion of the road was actually built, little evidence of it remained in 1907 when this background map was published.